FILE - Supporters of the Iranian opposition movement wear green during the funeral of Grand Ayatollah Hossein Ali Montazeri in the holy city of Qom Dec. 21, 2009. 1/3/18 9:24 p.m. — To sanction or not? Western intelligence officials are split on whether a new round of U.S. economic sanctions will help anti-government protesters in Iran or work to the benefit of the Iranian authorities by feeding into their claims that the unrest has been fomented by foreign enemies. This frame grab from video provided by Iran Press, a pro-government news agency based in Beirut, shows pro-government demonstrators marching in Bushehr, Iran, Jan. 3, 2018. 1/3/18 9:08 p.m. — Iranians have reacted dismissively to a series of pro-government rallies held in Iran on Wednesday, saying they appeared to be coerced in contrast to the spontaneity of a week-long anti-government protest movement that has posed the biggest domestic challenge to Iran’s ruling clerics in eight years. In the Wednesday edition of VOA Persian’s Straight Talk program, callers in Iran who said they witnessed the pro-government rallies told the hosts they believed the participants had joined largely under pressure from powerful institutions. 1/3/18 2:34 p.m. -- Watch the full interview between Vice President Mike Pence and VOA contributor Greta Van Susteren. 1/3/18 12:18 p.m. -- In an interview with VOA contributor Greta Van Susteren, Vice President Mike Pence said he hopes that the people of Iran understand that the U.S. wants to see them "achieve a free and democratic future." 1/3/18 11:23 a.m. -- Vice President Mike Pence has tweeted that the anti-regime protesters in Iran should know "there's bipartisan support in America for the freedom-loving people of Iran who continue to fight against their government’s corruption and tyranny." 1/3/18 9:48 a.m. -- Iran's Revolutionary Guards said the anti-government protests that broke out in the country over the past few days were at an end. "Today we can announce the end of the sedition," Mohammad Ali Jafari, commander of the Revolutionary Guards, said on its website. 1/3/18 8:41 a.m. -- President Donald Trump has issued another tweet about anti-government protests in Iran, saying he has "such respect for the people of Iran as they try to take back their corrupt government." 1/3/18 7:42 a.m. -- VOA's Persian service tweeted a photo of protesters gathered in front of the Iranian consulate in Hamburg, Germany in a show of support for anti-government protests taking place across Iran. 1/3/18 6:31 a.m. -- Pro-government demonstrators staged rallies across the country Wednesday, after days of protests against the government and economic problems. 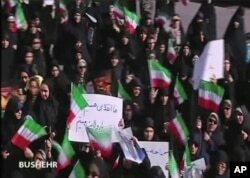 Iranian state television showed video of crowds waving Iranian flags and chanting in support of Supreme Leader Ayatollah Ali Khamenei. 1/3/18 6:00 a.m. -- Turkish officials say Iranian President Hassan Rouhani has told his Turkish counterpart Recep Tayyp Erdogan that he hopes protests in Iran will end in a few days. The two leaders spoke on the phone Wednesday, according to Turkey. 1/3/18 5:45 a.m. -- Factcheck: Russia says it never interferes in the affairs of foreign states, including Iran. Polygraph looks into Russian claims as protests in Iran continue.